Blizzard Creative Cooking Blast-from-the-Past Warcraft Stories? 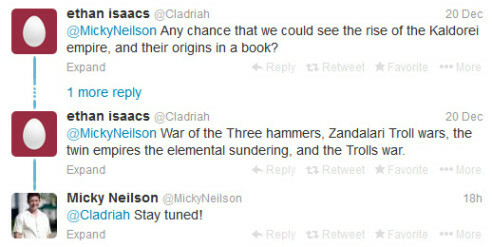 Micky Neilson tweeted to a fan “stay tuned” in response to the question: “Any chance that we could see the rise of the Kaldorei empire, and their origins in a book?”. Fans have asked for stories based on many past eras of Azeroth. The War of the Three Hammers, The Troll Wars with the Quel’dorei teaching magic to 100 Arathi men. The birth of the Council of Tirisfal, Aegwynn and The Dragon Hunt. Many more stories out there that have been merely described in a few paragraphs, but never fleshed out as a novel or a trilogy to expand the universe. Hearing Micky tease something is in the oven, lights up everyone’s heart. We are lore fans. These stories are our fuel to munch on and savor. What seems strange to me is that it is been a long time since we ever got a story that doesn’t tie-in directly with a current or upcoming World of Warcraft expansion. The Tokyopop Manga was a mix of independent stories and contemporaneous stories/tie-in stories. Is this new project a stand-alone story not tied to Warlords of Draenor? If it is tied, does that mean time-travel is involved? After all, this new parallel reality has a unmolested Azeroth with its own Nozdormu. We don’t know what an Azeroth where Sargeras has not been discovered within Medivh yet looks like. He never got to open the Dark Portal after Garrosh prevented the orcs from drinking the blood of Mannoroth. How would events have developed through without the orcs coming through the Dark Portal? Could there be wrong-happenings and exploits of the timeways in that new reality? If Sargeras couldn’t sway the orcs to come to Azeroth, did he find a replacement to move his agenda forward upon Azeroth? Between the time-lapse that Garrosh built the Iron Horde and the moment Kairoz opens a portal to the present to move forth the Iron Horde into Azeroth … where was Kairoz? Was he on a trip to mess further with the timeways? Just a loose thought. Hopefully, this new story isn’t that complicated, and just sticks to the facts as they originally happened. Yet, looking into that parallel Azeroth would be so interesting. Makes me think of Age of Apocalypse where Legion went back in time to kill Magneto, but instead accidentally kills his own father Xavier in the 1970s, which gave path to a world without Xavier and the X-Men. Things got chaotic and out of of control. A domino effect that re-wrote history. That would be a great story, and a complex one to write, but in the meantime a good old-fashioned Rise of the Kaldorei-like story would be pleasing to read, picking up right after the War of the Ancients .